"The 2009 GT-R is heir to Nissan’s legendary Skyline GT-R, a hopped-up salaryman’s car that started out as an Asian version of the original Pontiac GTO and grew into a cult icon as a video game superhero. Even so, Nissan dropped the Skyline name from the GT-R, it says, because the new model is built on its own platform. That’s true, but I also suspect that the generic name is a marketing move designed to make people say Nissan with GT-R so that listeners will know just which car is being talked about." "Fears that the GT-R might be the second coming of the Mitsubishi 3000GT VR4 — a ’90s-era twin-turbo, all-wheel-drive dreadnought that died as bloated as Elvis — should be put to rest. 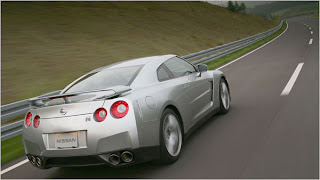 Yes, the GT-R is a four-seat coupe with a twin-turbo V-6 and all-wheel-drive. And it is loaded with treats like a paddle-shifted automated manual gearbox; an electronically adjustable suspension; and a choice among three levels of intervention by the electronic stability control." "But hot cars have a way of cooling down. For all its superlatives, initial demand for the GT-R will eventually be sated and fresh cars will arrive to capture the early-adopter crowd anew. And then the basic GT-R, with all its talents, will become a giant-slaying value, an everyday supercar for the label-agnostic. As the proverb goes, waku waku comes to those who wait."